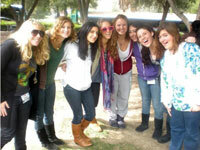 All Sunday classes are held at Emek Hebrew Academy, located at 15365 Magnolia Blvd in Sherman Oaks. Bus transportation is available from Los Angeles, The San Fernando and Conjeo Valleys, and Santa Clarita. Full time students, who take classes on one or more weekdays as well, can choose from the following branch locations for their convenience. 1039 S. La Cienega Blvd.